Three weeks ago a New York Times article reported on renewed speculations and debate that the bones of Jesus may have been discovered in Jerusalem. I doubt that anyone will ever be able to prove that these bones are those of Jesus. But it does raise the question: What is most important about Jesus? Theology or discipleship? That’s the question the Gospel of Mark raises. And I believe that’s the reason why Mark finished his Gospel the way he did, at verse 8 of chapter 16. As I have often explained, it is my conviction that the way we read the Gospel today and also at Pascha midnight, ending at verse 8, is exactly how Mark finished his Gospel. My friend in Scotland, Mike Mair, has an excellent blog site. Yesterday he speculated that the young man who met the women at the tomb was the same young man who ran away when Jesus was arrested (Mark 14:51). He ran away in fear. 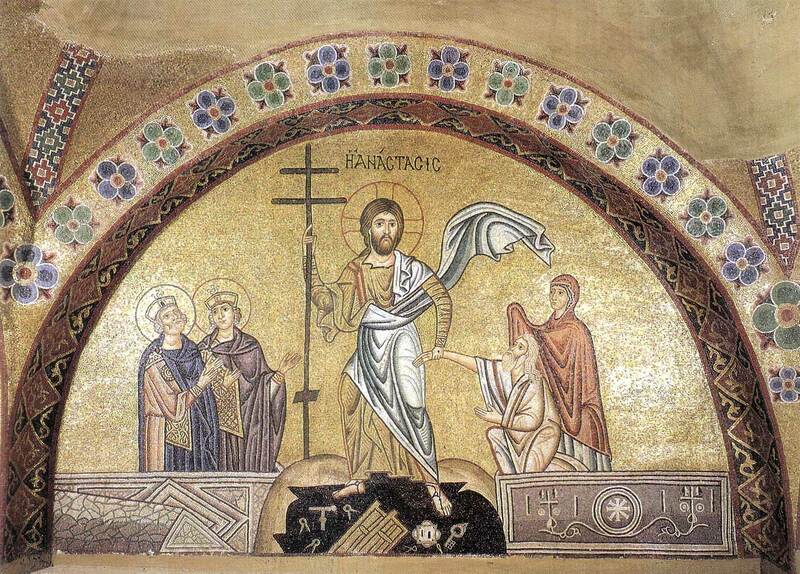 But now he becomes the messenger of resurrection, and it was now the turn of the women to flee in fear – εφογούντο γαρ! 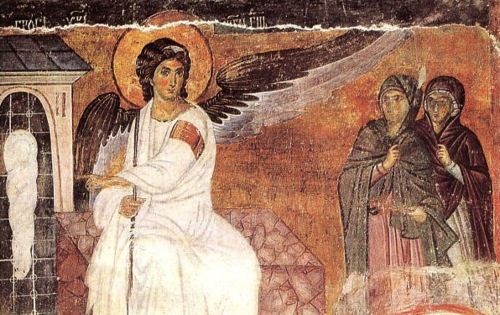 Although all Orthodox icons show an angel greeting the women, I like Mike’s suggestion. It makes for a more interesting encounter. The women and the young man are examples of discipleship, and so are the male disciples who have disappeared from Mark’s conclusion. Mark’s Gospel ends on a conjunction, trailing off into the new creation. We read it like that at the beginning of our Easter midnight service, where it trails off into the night air right before CHRIST IS RISEN is sung. 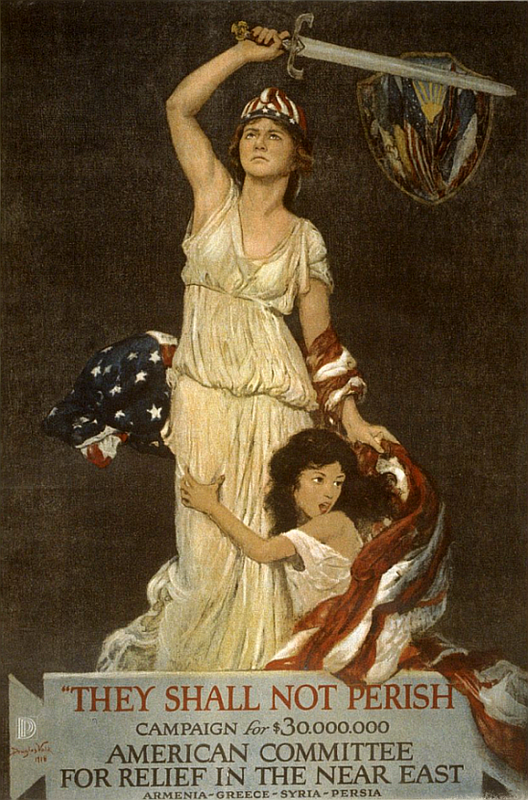 Powerful symbolism. We are like those disciples. How do we follow Jesus in today’s complicated and dangerous world? The world has always been dangerous for disciples of Christ. Complicated too! Each generation has to come to the same place as those women. They walked to the tomb, not knowing how they would move the stone. But they went, and their discipleship was answered in a totally unexpected way. They expected to find a dead body and instead heard news that filled them with joy and terror. If you want to find bones in Jerusalem, there are plenty – and not just ancient bones! If you want obstacles and excuses, there are plenty of those. 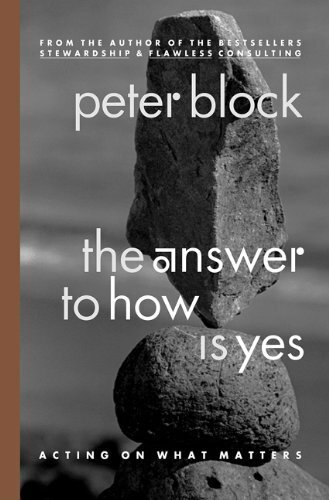 About a dozen years ago, at Borders Bookstore, I bought a book called, The Answer to How is Yes. It’s not a religion book. I loved to browse the many aisles of that wonderful, much lamented bookstore, and this book caught my eye in the Business section. The title and message of that book capture the situation of the women on their way to the tomb. The answer to How is Yes! It is also the answer to all our fears and questions about our church. How do we ensure the continuing existence and vitality of our church? Better yet, how do we make our church more vital and alive? The answer to every How question is always Yes. Categories: Sermons | Tags: Christian discipleship, myrrhbearing women, women at tomb of Christ | Permalink. 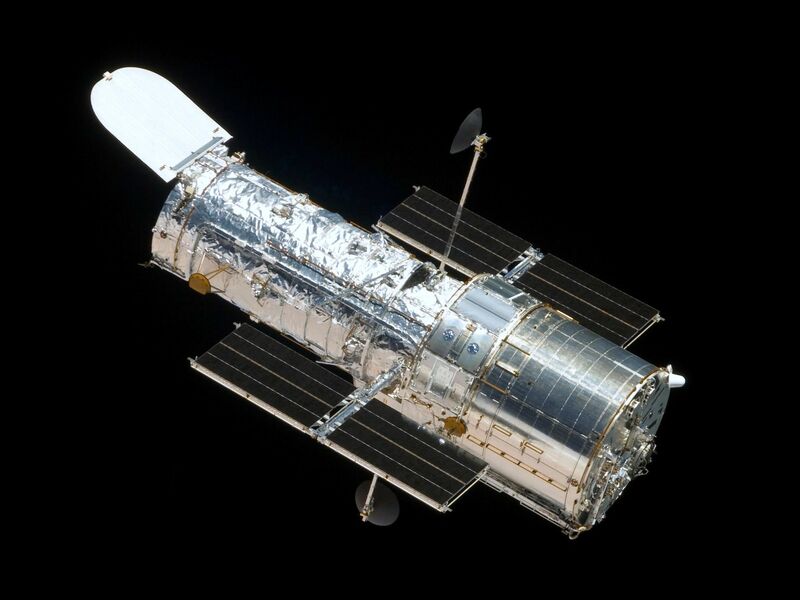 April 24th marks two very different anniversaries: the 100th anniversary of the Armenian Holocaust and Genocide and the 25th anniversary of the launch of the Hubble Telescope. The first anniversary represents the darkest side of human nature, while the second represents humanity at its most inspiring. 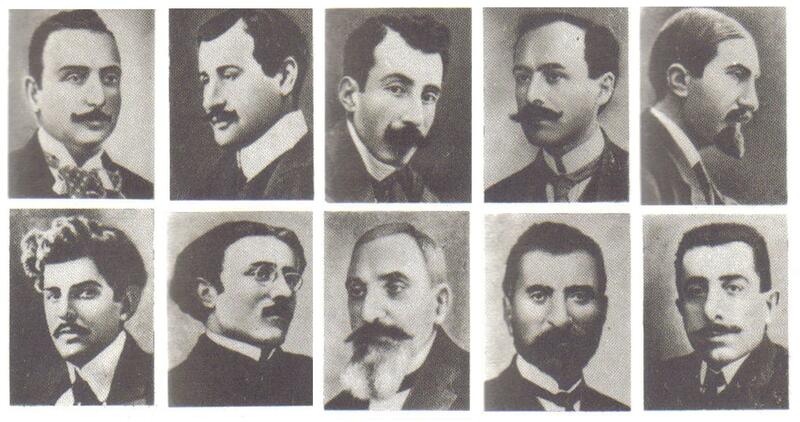 Armenian intellectuals who were arrested and later executed en masse by Young Turk government authorities on the night of 24 April 1915. The killing of Armenians by the Ottoman Turks began on April 24th, 1915, and took over 1 million lives by the time it came to an end. Armenians call it Medz Yeghern (“the Great Crime”) and it is acknowledged by most historians and governments of the world, but it continues to be denied by Turkey. As their empire faded into the dust, the Ottoman Turks also attacked other minorities, especially the Greeks and Assyrians. But the greatest tragedy was the one that befell the Armenian population. As the map further down graphically illustrates, the extermination of Armenians was conducted on a scale surpassed only by the Germans a couple decades later. Wholesale deportations, destruction of entire villages and communities, and concentration camps dotted the Turkish landscape. 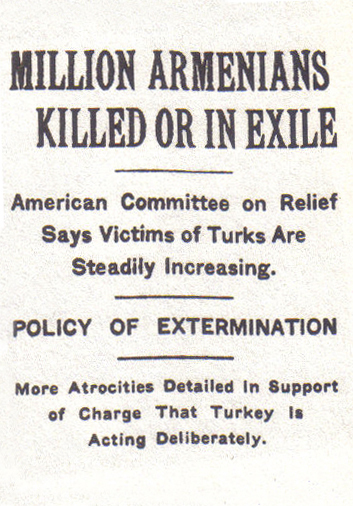 These killings were not a result of wartime, as the Turks continue to insist. This was a methodical attempt to exterminate an entire group of people. It was genocide by any definition! Armenian communities throughout the world – including our own state of Maine – are commemorating this great tragedy with many special events and memorial services. 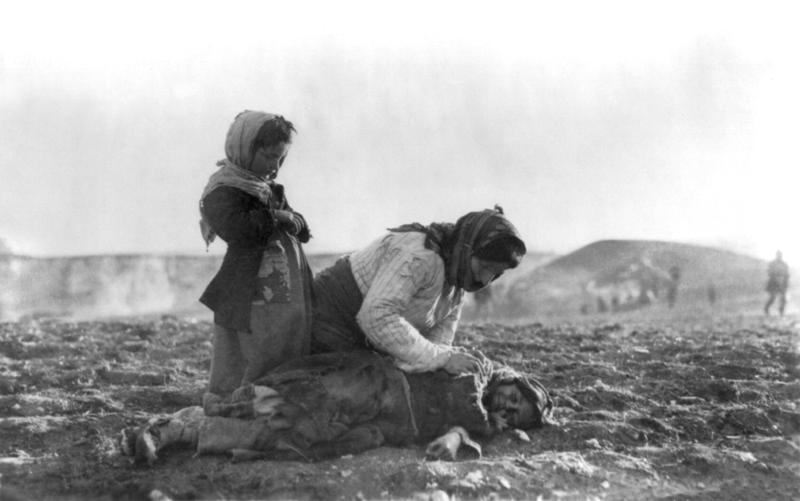 An Armenian woman kneeling beside a dead child in field within sight of help and safety at Aleppo, an Ottoman city. The Hubble Space Telescope in orbit, as seen from the Space Shuttle Atlantis. A god who condones violence – whether directly or by interpretation – is not a god worthy of the universe. On this anniversary of Hubble I’m tempted to say this about the Christian Church throughout the past 2,000 years. Would Jesus Christ identify himself with the hatred and selfishness that continue to be exhibited in his name? Or would Jesus tell us to gaze in wonder at every picture of space that Hubble sends down to the small-minded inhabitants of this earth? 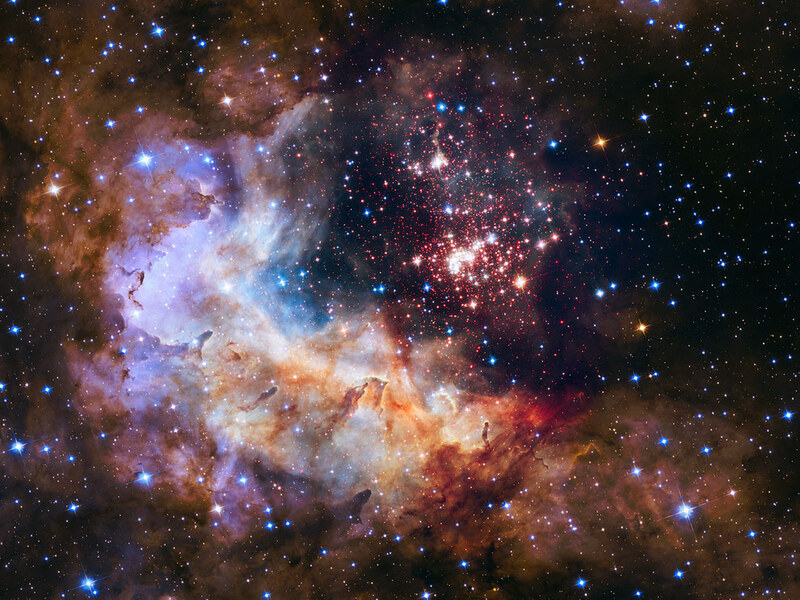 Yes, I can just hear the theologians object: But Jesus is the Word of God, he created this immense universe and all its wonders; he doesn’t need Hubble! You mean like he didn’t need this earth or a human mother? How easily we resolve everything by retiring to the divinity of Jesus! This is the monophysitic heresy of the church! Alive and well in every other sentence we speak or sing. No, I prefer to stop sometimes and think of Jesus alone on a mountaintop or in the desert, gazing at the starlit sky and wondering how deep is this ocean of light and darkness above us. How many wonders will be discovered in the centuries to come as human beings learn to look upward instead of downward and inward to our own selfish motives? 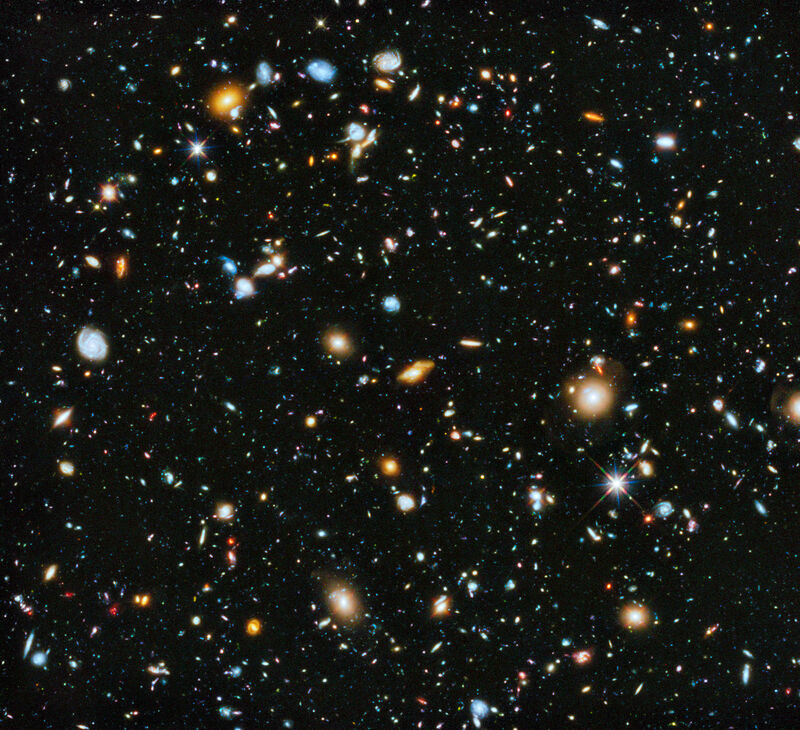 The Hubble Ultra Deep Field 2014 image includes galaxies existing shortly after the Big Bang. Human beings have continued in their inhumanity ever since Jesus looked up at the sky. And yet, scattered throughout our centuries of violence and hateful acts, great spirits have dared to look beyond our darkened hearts and look to the skies for glimmers of light and hope. Today, our machines and ingenuity have enabled us to look into the very depths and origins of creation – 14 billion years ago – and, at the other extreme, into the tiniest domains of existence, where strange particles and mysterious forms of energy are joining the dance of continuing creation. The Large Hadron Collider outside Geneva, Switzerland, is doing for the extremely small scale what Hubble is doing for the extremely large scale of creation. 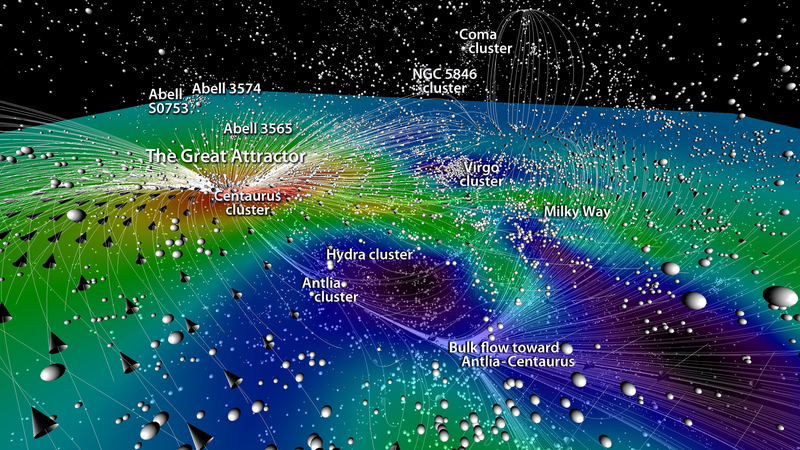 The maps of existence they are creating are enough to blow away every fundamentalist lie and deception. 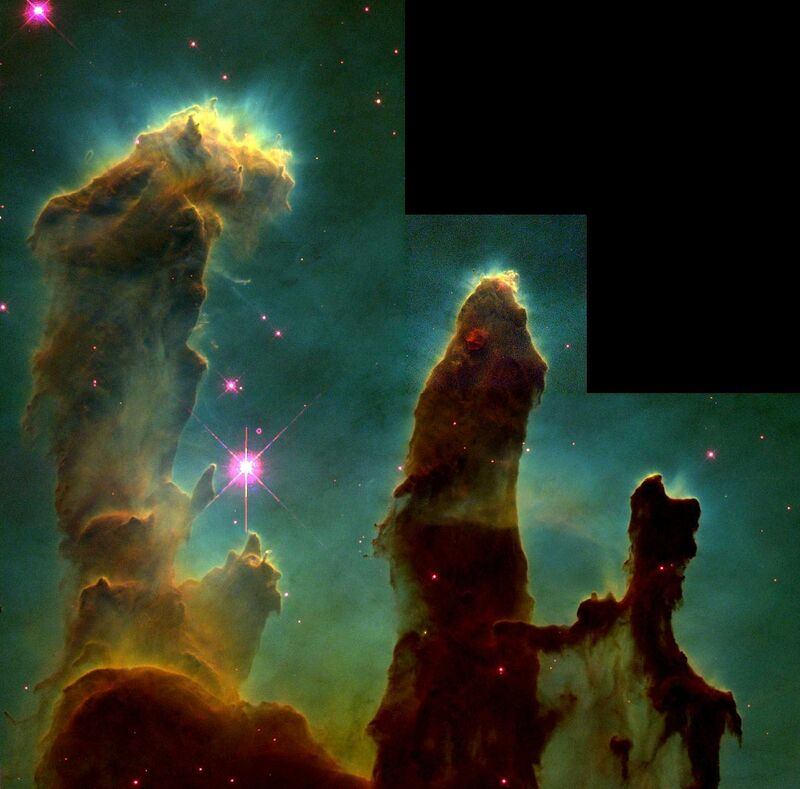 One of Hubble’s most famous images, “Pillars of Creation,” shows stars forming in the Eagle Nebula. There is creation all around us – the antithesis of our destructive urges. This is why the two anniversaries on this day pose such huge questions to us. Do we continue killing each other, often in the name of a god who is too small? Or do we join the galaxies and the subatomic particles in the dance of unity that many great scientists have tried to encapsulate in that ever-elusive “theory of everything”? Perhaps because it is a dance that unites all levels of being is the reason why it is so difficult to reduce it to a single theory or equation. Perhaps by trying to find a “theory of everything” scientists are making the same mistake that religions have made with their gods. Perhaps scientists are trying to make the universe too small, like religions make god too small. The universe is the great equalizer. It puts our human acts in proper perspective. As we remember one act of human evil, let us celebrate the goodness of a God who is not too small and who beckons us to look at the heavens above. Categories: Uncategorized | Tags: Armenian Genocide, Hubble Space Telescope, universe | Permalink. Arise Earth, Arise with Christ! Thomas F. Torrance (1913-2007) was one of the most important Christians of the twentieth century. A Reformed theologian in Scotland, he also practiced a deeply ecumenical understanding of the Christian faith and wrote extensively on the early Church Fathers, but with an honesty and critical insight unmatched by any contemporary Orthodox theologian. I made extensive use of Torrance in writing my dissertation on the Christology of St. Cyril of Alexandria, but I hadn’t touched any of Torrance’s books for thirty years – until recently, when I dug out my old Torrance books and began dipping into them again. It’s no easy task reading Torrance, and I have edited a whole page here to quote only the parts that are most easily understandable. But his point is very easy to understand. He is saying that when we separate creation from our salvation in Christ, we are reviving the old heresies of Arius and the Gnostics; indeed, we fall into paganism. Arius rejected the idea of Christ being the homoousios Son of God. Gnostics rejected the goodness of creation, and therefore they ended up denying the Incarnation. Orthodox theology affirms that the Son of God became truly and fully human, and in doing so tore down the separation between God and creation. In reconciling us with God, Jesus Christ reconciled all creation. If all this is true, should we Christians not be at the forefront of caring for the earth and celebrating its beauty? I see Earth Day as a day on which I can affirm my belief in the incarnation of the Word of God. 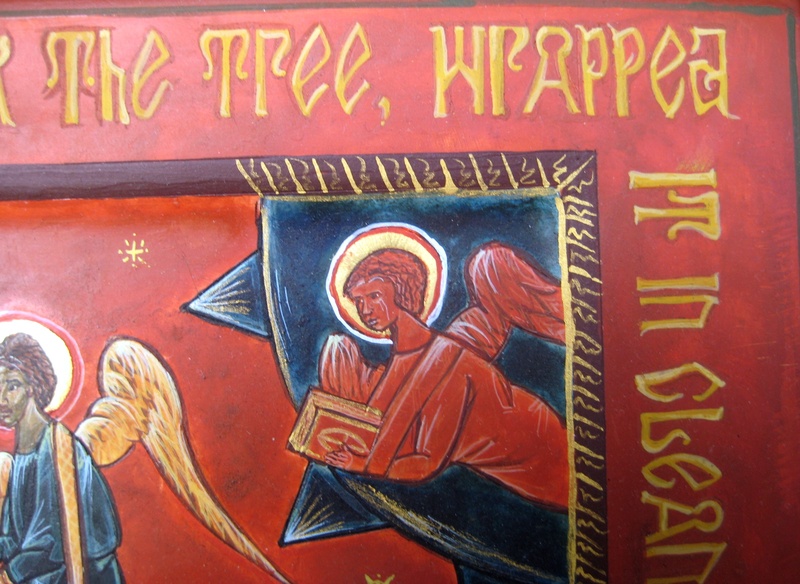 “The Word became flesh and dwelt among us” the Gospel of John declares in its majestic opening chapter. καὶ ἐσκήνωσεν ἐν ἡμῖν, the Greek text says: “The Word became flesh and pitched his tent with us.” It’s earthy language, the language of the desert and the sand – not the language of a nice home in the suburbs. Everything about Jesus is earthy, because we are of earth and to earth we return. Let us take care of our earthy home. Let’s pitch our own tents and walk barefoot and lightly on our beautiful planet. Let us do our own part in protecting this precious gift from God. It is the only home we will ever have. Happy Earth Day! 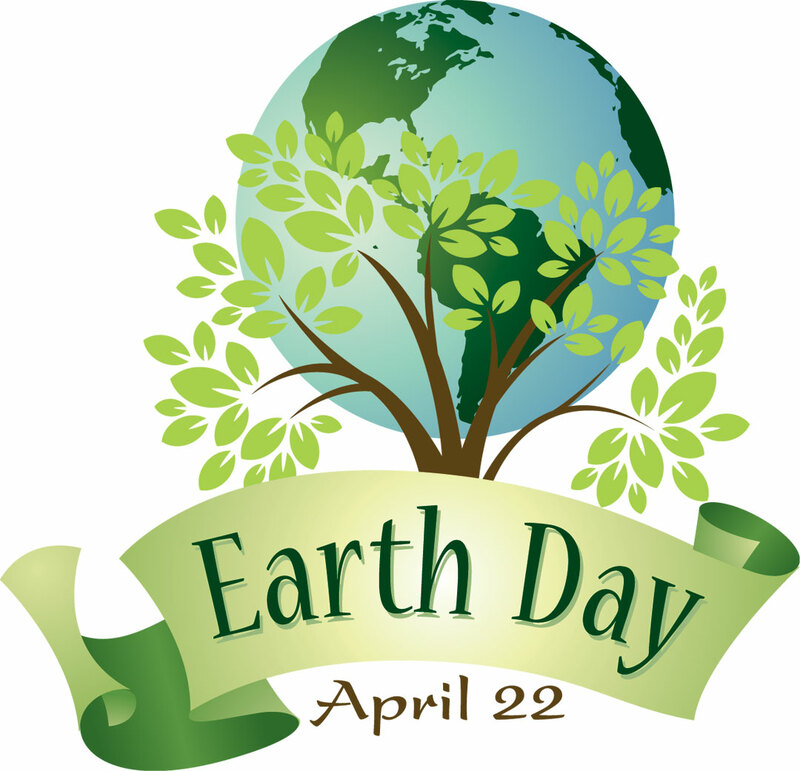 May every day be earth day! CHRIST IS RISEN! The whole creation is risen with him!! 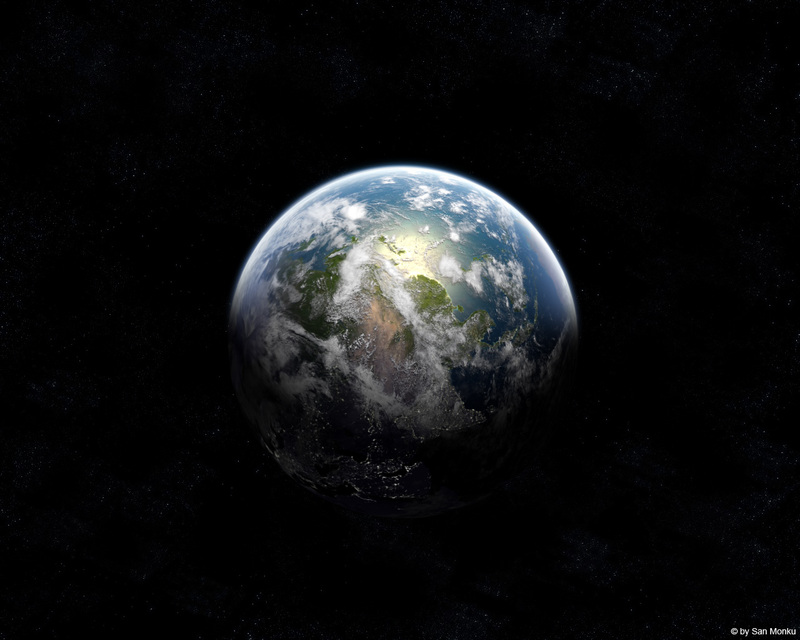 Categories: Global Visions | Tags: Earth Day, T. F. Torrance | Permalink. The place of the Gospel of John relative to the other three Gospels. Its use in the Orthodox Church in the cycle of readings. 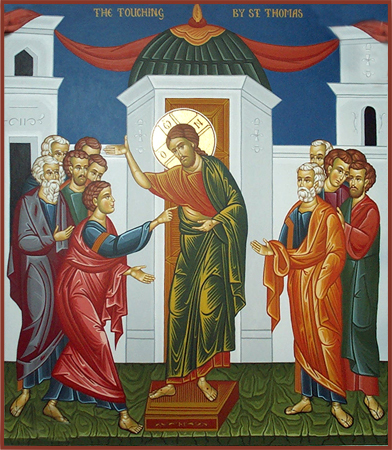 Midnight service of Pascha: We begin with Mark 16:1-8 and that amazing conclusion that trails off into the night: εφοβούντο γαρ. But at the Liturgy that follows we read John 1:1-17 with the climactic affirmation, The Word became flesh and dwelt among us. More properly and literally: The Word became flesh and pitched his tent with us. It’s all about touch. The Word became flesh. And now that flesh is the one Thomas is invited to touch – that divine flesh that took upon itself all the pain and suffering of humanity. When responding to Thomas, Jesus said, “Blessed are those who have not seen and yet believe.” He didn’t say, “Blessed are those who have not touched and yet believe.” He couldn’t say that, because that’s what the Christian gospel is all about: it’s all about touch. Categories: Uncategorized | Tags: Thomas Sunday, Word became flesh | Permalink. What proof do you want to believe in God? Do you want a scientific proof or a proof by logic? Do you want a big miracle? Like solving climate change, so we can continue our wasteful and polluting life styles? God did a big climate-change thing long ago (Genesis 7), but people still didn’t believe, so why should it be different now? Perhaps God should drop food from heaven to eliminate hunger? God did that also long ago (Exodus 16), and people still didn’t believe! How about God should bring back from the dead someone you loved who died too young? God did that also (Luke 7:11-15), and people still didn’t believe. Or perhaps you just want some display of power. Like dividing the Red Sea (Exodus 14). But we know how quickly people forgot about that show of power! God gave up trying to impress people and chose another way. God answered Thomas’ doubts with the wounds of Christ. Here, touch and see – not some spectacular show of power, but the wounds of humanity. And those wounds have now become God’s wounds! That’s the proof that God offers. And it should be all the proof we need. No miracles or displays of power that can be ignored or explained away by inconsequential explanations. The proof that God offers is the miracle of a love that bears the marks of all human pain and suffering. That’s the God I believe in. It’s the only God worth believing in! Categories: Uncategorized | Tags: Apostle Thomas, proof of God's existence | Permalink. Except he really didn’t rest. Though his body lay in a tomb, in spirit he descended into the realm of Death and liberated all humanity. It is the holiest of all Sabbaths, a Sabbath for the entire world, for all humanity, for all creation! Everything needs liberation from the inevitability of death and decay and the fear that is produced by those realities. Jesus descended into the lowest depths of human non-existence to make everything new! It is the new creation that is announced on this Holy and Great Saturday. God rested on the seventh day after the original creation (Genesis 2:2). Now, on this new seventh day, Jesus creates again: he creates new hearts and minds, new lives, and a new way of relating to God and to each other. Are you in? Are you experiencing the new creation? You see, we are one with each other, with all creation; and most wonderful and gloriously, with God through Jesus Christ our Lord, in the one Holy Spirit that adopts us as children of God. This is the same Epistle passage that we read at every Baptism. Also at this Liturgy we sing the same hymn we sing at every Baptism: “As many as have been baptized into Christ, have put on Christ. 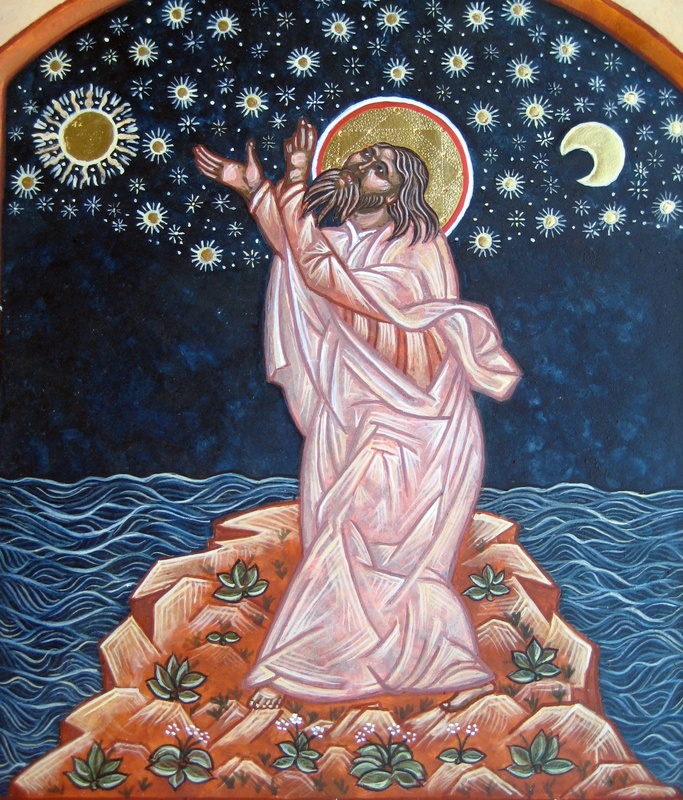 Alleluia.” All this reminds us that in the early centuries of the Church, this day and this evening, leading up to the announcement of Christ’s Resurrection, was the time for the baptism of new Christians. It is the celebration of new creation. Everyone baptized into Christ has put on Christ and is a new creation, Paul tells us. And as new creation, we share the destiny of all of God’s works. And that destiny is glory! Glory, not postponed to a future eternity, but glory that begins right here, in this life, when we allow ourselves to be transformed by the liberating power of Christ that comes to us through the Holy Spirit. By the end of the morning Liturgy we are already in the time of Christ’s Resurrection – which is why in Greece this Liturgy is popularly known as the First Resurrection, Η πρώτη Ανάσταση. 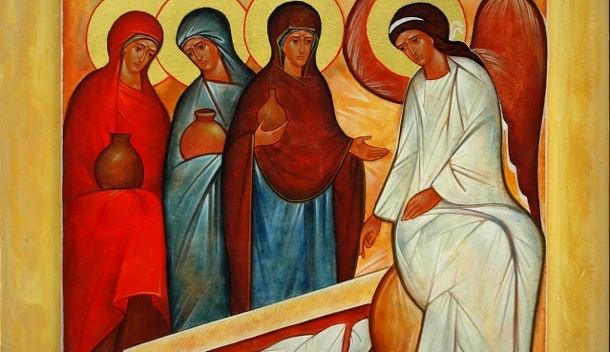 Tonight at Midnight we will proclaim the Lord’s Resurrection openly and sing the joyful hymn, “Christ is Risen from the dead, trampling down death by death, and to those in the tombs bestowing life.” But the Resurrection is already a reality, on this holiest Sabbath. Enter into the creative, renewing rest of your Lord! And then, say with all your heart: CHRIST IS RISEN! TRULY HE IS RISEN! 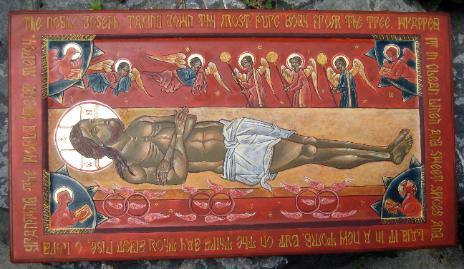 Categories: Uncategorized | Tags: Epitaphios, Holy Saturday, New creation, Resurrection, Sabbath | Permalink. Giles Fraser is a brilliant religion commentator for the Guardian newspaper of London, and I’ve referred to him in a previous post. He is Anglican, but seems to have an immense understanding of all Christian traditions, including our own Eastern tradition. He is also able to communicate the deepest truths of Christianity in our contemporary historical setting. On this Holy and Great Friday in the Orthodox Church he wrote a brilliant commentary, which I thoroughly recommend: Arguments over Greek debt echo ancient disputes about Easter. It is refreshing every year to go through the many, many services of Holy Week and see how little emphasis we Orthodox place on gruesome images of the Cross. Of course we read the Gospel passages that detail all the events of Christ’s passion; and of course we understand the saving power of the Cross. But this saving power of the Cross is seen in cosmic and enduring terms. The Cross of Christ is not a once-and-for-all deal that God made to repay an “infinite debt” that we human owed to God. God is not a banker or tyrannical taskmaster who wants repayment at all cost! We are sinners, and we needed salvation. But the Cross is more than a payment of debt. If there are any Orthodox references to “debt” they are minor. The Matins of Holy Friday (which is usually observed on Thursday night) shows little awareness of that idea, as Giles Fraser correctly perceives. The emphasis instead is on man’s rebellion – reflected especially in Judas’ betrayal and the actions of the Jewish leaders. The hymns of Holy Friday that we heard Thursday night and will hear this afternoon in the Vespers service do carry a lot of anti-Jewish baggage; and that’s one area we Orthodox need to clean up our act and clean up our language. But all those black-robed and bearded leftovers of a bygone era (like the ones pictured in the Guardian article) will not let the church modify our liturgical and hymnographical wealth – and that’s the tragic reality of today’s Orthodox Church. These words echo the judgments of the Hebrew prophets (Isaiah, Amos, Hosea, Jeremiah, etc.) in the centuries before Christ. But they are also addressed to us, who continue to rebel against even greater acts of God’s benevolence. If Israel of old was guilty of ingratitude for the liberation from Egypt, how much greater our own guilt when we ignore the gift of Christ?! Reflecting on our own sins and acts of rebellion should modify any anti-Semitic thoughts we may harbor. The Cross is God’s final answer to human rebellion. God did not allow his Son to be crucified in order for his wrath to be appeased or for a “debt” to be repaid. God allowed his Son to be crucified in order to show how great is our rebellion! Preaching will only go so far. The prophets preached and preached against the people’s rebelliousness, but achieved nothing. And the Christian tradition has cheapened their message even further by turning Isaiah and the other prophets into forecasters of Christ’s coming – instead of seeing their messages as ever- and always-relevant to every generation. Though worldly and spiritual powers imagined they defeated Jesus on the Cross, on the contrary the Cross was God’s victory over the worldly and spiritual powers that rebel against God’s goodness. 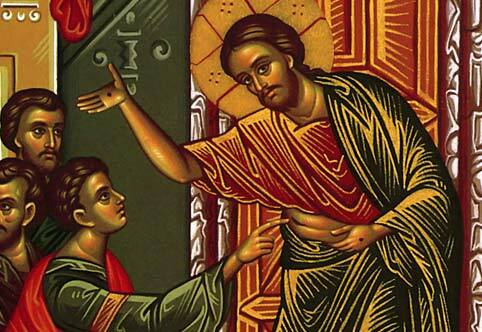 Death was mocked, as we so loudly proclaim at the midnight Liturgy of Easter/Pascha. But note in this quote from Colossians, that even the Law and the “legal demands” that God gave to Moses and the people of Israel are renounced and put into the same category as the powers and rulers that oppose God! This is one of my own favorite passages in the Bible: it is an amazing, revolutionary thought! And if you really take Paul’s thought seriously, it is a rejection of every religious system! The Cross was God’s victory over every system that aims to control human life. God nailed all worldly and spiritual powers to the Cross and demonstrated their futility. We subject ourselves to teachers and systems that pretend to improve us, only to discover how pointless they are. Every fad diet, every new age spirituality, every system of self-improvement and self-realization, and indeed most forms of Christian preaching: they are all powerless, unable to achieve anything, because they were proven to be empty and futile on the Cross! The powers and systems were defeated on the Cross. Death itself, the final enemy, is mocked and defeated at the Resurrection. To reduce the Cross of Christ to a transaction is a crime like the crucifixion itself! Σήμερον κρεμᾶται ἐπὶ ξύλου, ὁ ἐν ὕδασι τὴν γῆν κρεμάσας. Στέφανον ἐξ ἀκανθῶν περιτίθεται, ὁ τῶν Ἀγγέλων Βασιλεύς. Ψευδῆ πορφύραν περιβάλλεται, ὁ περιβάλλων τὸν οὐρανὸν ἐν νεφέλαις. Ῥάπισμα κατεδέξατο, ὁ ἐν Ἰορδάνῃ ἐλευθερώσας τὸν Ἀδάμ. Ἥλοις προσηλώθη, ὁ Νυμφίος τῆς Ἐκκλησίας. Λόγχῃ ἐκεντήθη, ὁ Υἱὸς τῆς Παρθένου. Προσκυνοῦμέν σου τὰ Πάθη Χριστέ. Δεῖξον ἡμῖν, καὶ τὴν ἔνδοξόν σου Ἀνάστασιν. Today is hung on the Wood the one who hung the earth upon the waters. The King of the angels is crowned with thorns. He who wraps the heavens in clouds is wrapped in the purple of mockery. He who freed Adam in the Jordan now receives blows upon his face. The Bridegroom of the Church is transfixed with nails. The son of the virgin is pierced with a spear. We venerate your Passion, O Christ. Show us also your glorious Resurrection. Rebellion against God is universal, cosmic even. So God’s answer is cosmic! The Cross is about more than me and my personal relationship with God. All self-absorption and self-nonsense is defeated on the Cross. The Resurrection is in front of us. Let us look to the answers it provides on this holiest three-day weekend of the year. 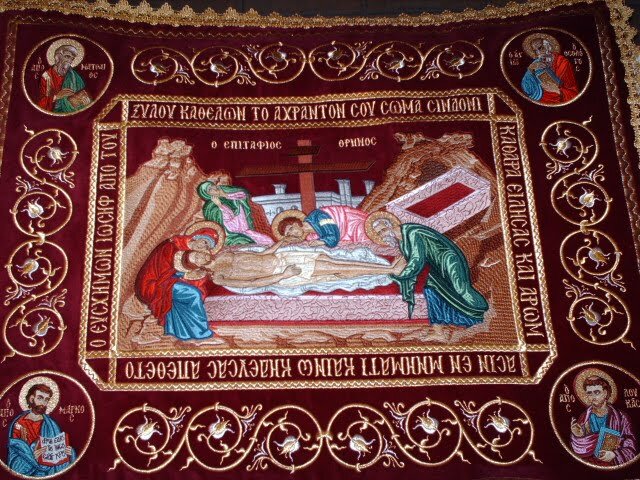 Detail of the Epitaphios Icon (betsyporter.com) – Click to further enlarge. Categories: Radical Christian Thoughts | Tags: Cross of Christ, Giles Fraser, Holy Friday, Holy Week, Orthodox soteriology | Permalink.